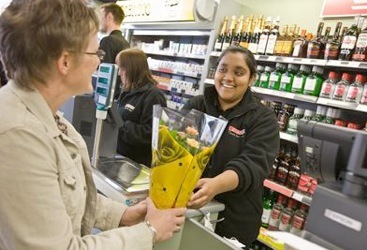 The introduction of EPOS software into the retail world has had a huge impact on the way companies do business. The ability to track sales, identify badly performing lines, control stock levels and a host of other benefits, has greatly streamlined operations. One area that EPOS software has benefitted both the retailer and the consumer is the speed with which transactions can be completed. However, if you don’t have the right hardware to back up your EPOS software, you could be severely hamstringing your business. Read on to discover four useful tips for getting the right hardware to support your EPOS software. Whether it is on a self service till, or a staff operated till; barcode readers greatly reduce the time that it takes to register an item. This of course prevents long queues from forming and keeps your customers happy. However, cheaper barcode readers can have problems with the scanning operation and items often don’t register. It is worth paying that bit extra to get the quality readers that will keep things running smoothly. Using your fingers is one the most instinctive human actions that you will undertake. In many businesses it is possible to completely remove the need for mice or keyboards and keep things as simple as possible for staff members. This of course also applies to customers on self service tills. If you can’t integrate a complete touch screen solution; do try and save processing time by using hotkeys on the keyboard rather than navigating through use of a mouse. It may seem a small point, but your receipt printers are also an important piece of hardware. Before you purchase them be sure to check how easy they are to change as there is nothing more annoying for a customer than having to wait whilst a staff member struggles to replace a till roll. As and when new technology becomes available make sure you take advantage of it as soon as is possible. This could range from updating your EPOS software to the latest release version to installing new biometric identification equipment that is just around the corner. Contactless technology is the current hot topic, which allows consumers to make small purchases without the need of verification. Thanks to Michael, one of the many external authors of TechPatio.com, for submitting this guest article.